When we think back on the themes of Game of Thrones, it’s easy to come away with things like man’s inhumanity to man, the futility of war, or that those who don’t learned history are condemned to repeat it. After all, most of the non-dragon goings on are taken directly from human history. As I re-watched season seven to prepare for tonight’s episode, my takeaway is that the kind of person you are impacts what lives on after you die. Not your rank, wealth, or even your heroic deeds. Good men inspire others to do good. Evil men become cautionary tales, or are forgotten outright. Coming into this season, we’ve definitely got some loose ends and wild cards. A few readers are no doubt still waiting for book things that are possible, Stonehearts and such. I am not convinced that the Blackfish is really dead, mainly because I like him and think an off-screen death was a huge cheat. Edmure is around someplace, but who knows where he went, or if he even escaped the Freys. Heck, D’ario Neharis could still be alive for all we know. There is one more theme Varys threw in our faces this week: Nothing Lasts. The older you get the clearer it becomes that the toughest men, the strongest armies, the best discoveries, are all doomed to fail and change and fade. Just look at how much our characters have changed since we met them back in season one—the ones who are left anyway. Maybe that’s why all these characters meeting up again after long absences is so satisfying to watch. 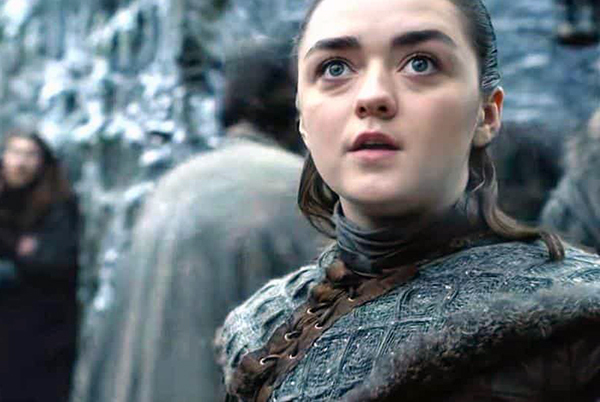 Arya’s reactions to seeing Jon, then the Hound, then Gendry were all wonderful—though maybe not as awe-inspiring as her reaction to the dragon. Wow. Speaking of Gendry, he’s probably a strong contender for king. Why? Well, the whole intro of the show changed tonight. The Wall is broken, snow is everywhere, the stories on the banners have gotten longer. But you know what hasn’t changed? Lion, Stag, Wolf, Dragon. The four heads of the main houses—except that there hasn’t been a Baratheon in play for some time. Aside from my theory that Podrick Payne is also one of Roberts natural children, Gendry seems like a good bet to sit the Iron Throne. The North is none too pleased at Jon bringing Dany with him. We see that Missandei and Grey Worm are getting looks from Northerners who have probably never seen anyone that dark before. Lyanna Mormont is the most furious and vocal, even edging into treasonous talk about him maybe not being King anymore. Sansa is also not cool with this, not that we blame her. If they threw down in fisticuffs, I have to think Sansa would mop the floor with Dany. 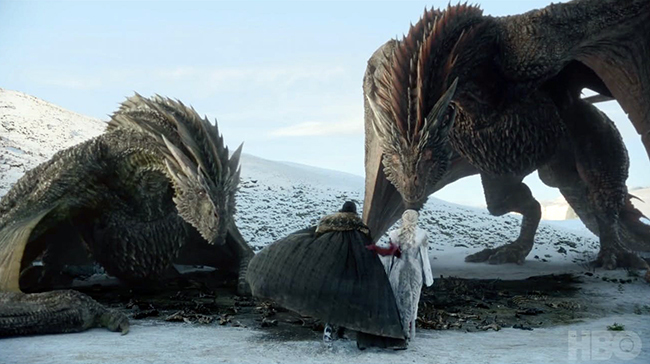 Still, “What do dragons eat, anyway?” “Whatever they want.” Beautiful exchange! Arya’s reunion with Jon put to rest one of my fears. Last season when Arya and Sansa reunited, Sansa said “I remember how happy he was to see me, when Jon sees you his heart will probably stop.” We know Game of Thrones likes to throw those kinds of hints at us. So I was glad to see that the two were able to hug and speak and compare swords all while breathing normally. Notice too that when Jon expresses frustration with Sansa, Arya takes her sister’s side. That’s something that never would have happened in season one. Back in King’s Landing, we know that Qyburn is feeling lucky to be in Queen Cersei’s employ. But check out the look on his face when he informs her about The Wall being breached. He’s clearly worried by the news, and stunned by her curt, “Good.” Elsewhere, it seems that Cersei and Euron are getting into something of a relationship. Well, they’re working together and sexing each other though neither of them seems especially fond of the other. All part of the great game I guess. I was pleased to see that Asha/Yara is still alive. I love her. We haven’t seen Ellaria Sand in a minute, not Septa Unella for that matter. I wonder if they’re still being tortured. Also, Cersei is pretty smart hiring the Golden Company. You’d think maybe she could figure out that elephants are not well suited to a long sea voyage. Duh. Ser Bronn’s trip to the brothel may have given us our funniest quip of the night. We all recall how upset fans were at Ed Sheeran’s cameo last season. HBO has heard you, which is why a ginger soldier named “Eddie” has his eyelids burned off. I thought he was just fine, and that you guys are all mean for making fun of him. Bronn has a sizeable task ahead of him, and a few tough choices. Cersei wants him to murder both of her brothers, with Joffrey’s crossbow no less. Of course, Bronn is friends with both brothers so this may just be a game Cersei is playing to expose Bronn’s disloyalty to the crown. Bronn loves money and all, but I don’t think he’ll kill either one. How awesome was Theon saving Asha/Yara? It’s the kind of symmetry and joyfulness that we rarely get on Game of Thrones. She’s right that they’ll need the Iron Islands if they have to retreat from the white walkers. I also loved that Yara allows Theon to return to Winterfell. She no longer finds it shameful that he has two families. I was pretty sure we were about to see a terrible death to balance that out. Nope, just a gratuitous dragon ride that seemed longer and bigger than was necessary. We do learn a few things from this scene though. It’s really snowy. Also, Drogon definitely has an opinion on Dany and Jon’s relationship. Maybe unlike Dany and Jon, Drogon knows that Jon is riding a dragon with whom he basically shares a name. I want Arya and Gendry to get married. But that’s not the biggest news in Winterfell. Sam is thrilled to have the favor of the Queen for his work in saving Ser Jorah. But when Samwell explains why he needs a pardon, the conversation takes a giant turn. 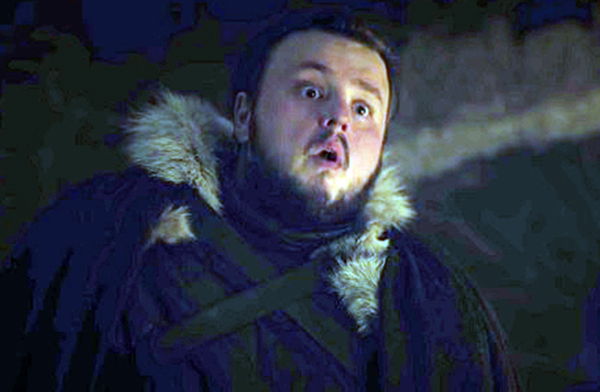 Samwell was surprisingly broken up about the death of his cruel father, which shows you what a good guy Sam is. But learning that Dickon (* Bronn snicker *) is also dead seems to have broken his brain. Who can blame him? People can only take so much. Samwell gets very little time to process this, since Bran decides it’s time for Jon to know his whole truth. When he does, Jon calls it “treason.” Americans like me have been thinking a lot about treason of late. Jon’s claim isn’t treasonous, it’s just a fact. He’s also pretty pissed that Ned lied to him his entire life. Understandable. But of course Robert would have killed him. Even Jon must know that. Samwell played this all beautifully, showing us how sometimes the quietest characters can say the most. We were almost to the end of “Winterfell” when I realized we hadn’t had a horrifying or tragic death yet. Lord Glover has gone back on his oath yet again, so I thought it might be him. Cue Tormund, Beric, and the gang heading off to check on the Umbers. Alice Karstark brought her people to Winterfell, but Little Lord Umber never showed up. There’s a reason for that, and it’s horrifying. Poor Umber is made an example of in a way that would have made Hannibal Lecter proud. That hideous message from the Night’s King along with the terrifying screams of the boy, the fire—holy crap. It was amazing and upsetting and enthralling. Better still, Tormund is alive and well and free to pursue Brienne of Tarth. Yay! Ed and some Night’s Watch guys are around, and have joined up with what’s left of the Brotherhood without Banners. The end of this season’s premiere echoed the end of the first episode of the series. We recall that Bran being thrown out the window by Jaime is how that episode ends. Jaime and Bran have had no contact since. This week, we see Jaime’s arrival at Winterfell only for him to immediately spot Bran in a wheelchair. In fact, Bran tells Sam he was waiting for “an old friend.” I sincerely hope that’s where we pick up next week. As we know, there are six episodes total in this final season. 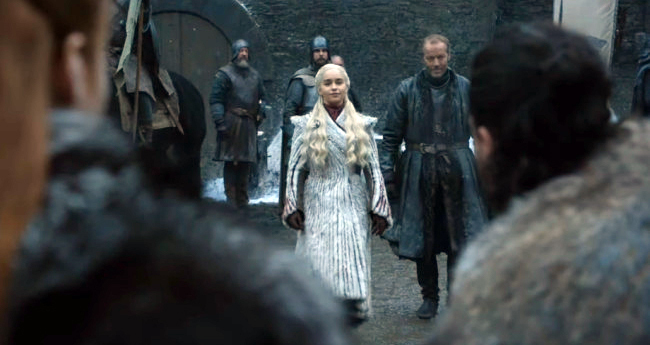 I’m glad to see that most of our key characters (outside King’s Landing anyway) are slowly being outfitted with Valeryan steel swords and dragon glass weapons. That’s good. I’ve been waiting for someone to find a clutch of dragon eggs since Viserion and Rheagal escaped Mereen. Nope. I was sure there would be more in Dragonstone. But again, no. I’m not giving up hope. What’s the thing you most want to see before the series ends? The final season of Game of Thrones starts with uncomfortable reunions, soldiers galore, and dragons. Ned Stark, despite having died seven seasons ago, continues to be a major influence on our characters today. Arya, Jon, Sansa, and even Theon all continue to look to his wisdom in their decision making. Jeor Mormont inspired Samwell to cure Ser Jorah. Even Khal Drogo's strength and brutality live on in his namesake dragon. Meanwhile, the Boltons are—as Sansa predicted—nowhere.